Gamestop has a pretty sweet deal on the PS4 Pro through the 19th. The Playstation 4 Pro is on sale for $350 plus you get CoD WWII and your choice of Star Wars Battlefront II or Fifa 18 for free. Got lucky almost didn't scroll down and notice the SWBII/FIFA promo it's listed down the page and you get no warning at checkout about it. You have to add BF2 or Fifa to the cart yourself before the promo kicks in. 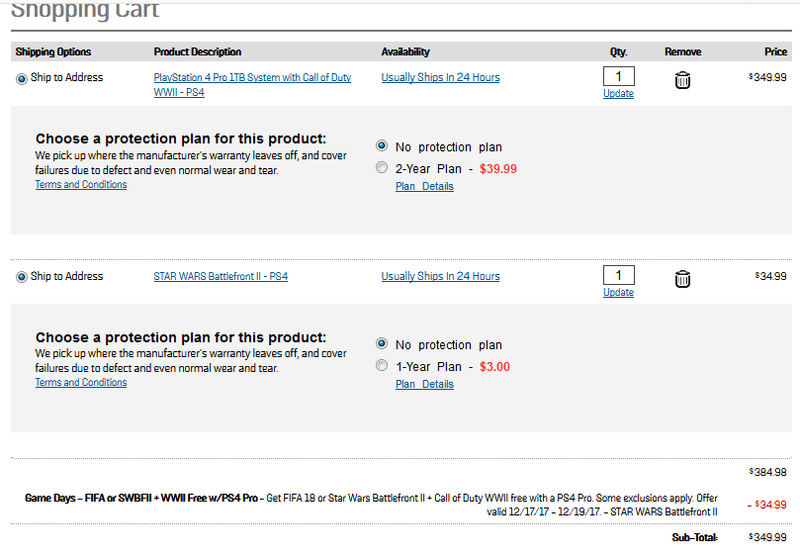 Better Get it fast though I think the $350 bundle is a screw up and the price was supposed to bump up to $400 again. Dead price corrected to $400.